As a friend recently pointed out, the Poles can be a bit sexist when it comes to their produce. For example, Swiss chard is called mangold in Polish. I have to chuckle a little bit. Such fresh and lovely produce at the Zielony Jazdów market in Warsaw. A few weekends ago, I purchased 50 pln (about $15) worth of fresh veggies from the small Zielony Jazdów market at the top of the Agrykola Park in Warsaw. We got several meals out this wonderful produce, and it lasted 10 whole days for us! 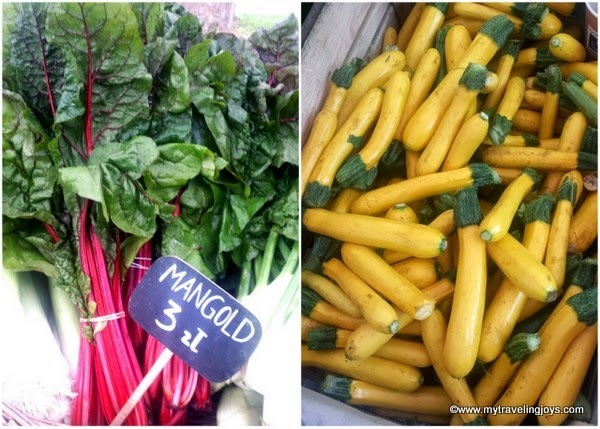 You can stop by this local market for fresh, unique produce on the weekends through September. The mangold doesn’t seem to be very common in Poland, but I’m happy to see it make an appearance. Botanically, mangold is related to spinach and has some of the same nutritional properties such as vitamins C, E and K as well as being rich in manganese, calcium and iron. If you can find some at your local market like I did, I’d recommend grabbing some this fall. Or in a pinch, you could always substitute kale or spinach for the Swiss chard in the recipe below. Hubby was surprised at the spiciness and garlicness of this tasty side dish. I just needed some assistance to perfect the poached egg on top! Who knew that eating healthy could taste so good! One bunch Swiss chard (about 500 grams), washed, trimmed. Stalks and leafy part separated. 1. In a small pot, cook the quinoa in boiling water with a pinch of salt. Let the quinoa simmer until the water is mostly absorbed by the quinoa. Turn off the heat and set aside. 2. In a large sauté pan over medium heat, add the olive oil and pul biber. Let sizzle for a few seconds, but being careful not to burn the pepper flakes. Then, add in the stalks and cook about 7-8 minutes, until tender. I placed a lid on top to help the stalks cook faster. 3. Then, add in the garlic and sauté for 1 minute. 4. Next, add in the leafy pieces of Swiss chard and sauté until tender over medium-low heat. About 5-8 more minutes, until the greens are wilted. You may need to add a splash of water to help the greens cook. Set aside. 5. Lastly, set up a pan for poaching the eggs. We always follow Alton Brown’s recipe for poached eggs, but set a timer for only 4 minutes because we like runny eggs. 6. To serve, place a spoonful of the Swiss chard mixture in a bowl, topped with the quinoa, followed by the poached egg and toasted pine nuts. Season with salt and pepper as needed. Step 4: Adding the Swiss chard leafy greens and cooking it all together. this sure looks good. i love this time of year. there is so much to choose from in the markets and my garden. i am about to roast some root vegetables from my garden for lunch today. I wish quinoa was a bit cheaper here in Turkey. I will have to bring some from abroad on my next trip. @Joyce, Fall is definitely your season! I just picked up my first butternut squash of the season today! Mmmm!